D.71A. Formerly Amsterdam, R.W.P. de Vries (dealer, 1929). Pen and ink and wash, 30 x 22.5 (see sales catalogue below); wm?. Dessins de maîtres anciens et modernes, sale’s catalogue, R.W.P. de Vries, Amsterdam, 1929, lot 26, as Luca Cambiaso. Carroll, 1987, 316, 318, n. 1, under no. 101, as a copy of a lost drawing by Rosso. D.71B. Edinburgh, National Galleries of Scotland, RSA 1369. Pen and black ink and grayish brown wash, possibly over faint traces of black chalk; 30.2 x 21.6, but 0.2 wider at the toes of Christ that have been cut around; tip of upper left corner missing and a tear at the lower right, laid down; wm? ; slightly foxed and a brown stain at the lower left. These three drawings, none of which is of the quality of Rosso’s autograph drawings, show exactly the same composition, although the Amsterdam drawing is slightly cut at the left and at the bottom and the drawing in France has its lower right corner missing and re-drawn without the right foot of the Virgin. The composition of the Edinburgh drawing is possibly slightly enlarged at the top and bottom. All three drawings show the same lines and rows of small parallel strokes, but it seems that the penmanship of the Amsterdam drawing is the most accurate in recording Rosso’s. The placement of the washes is about the same in the Amsterdam and French drawings, but, judging from photographs, those in the French drawing, although faded, it would seem, are more subtle in their variations. 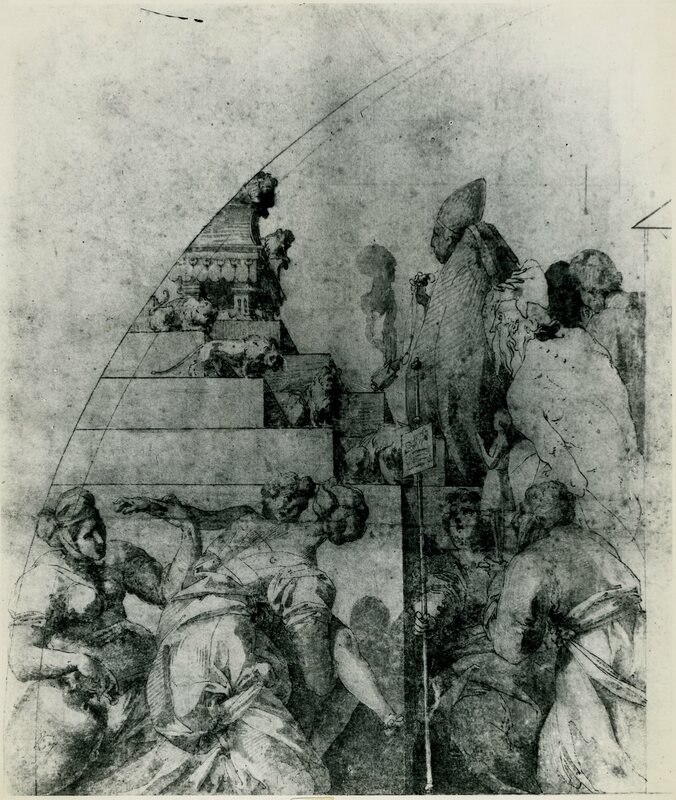 The washes in the Edinburgh drawing are only partially related to what appears in the other drawings, and are somewhat difficult to follow in regard to their function within the composition, suggesting that the draughtsman here was less faithful to his model. But even in the other two copies the correspondence of the washes is not complete. 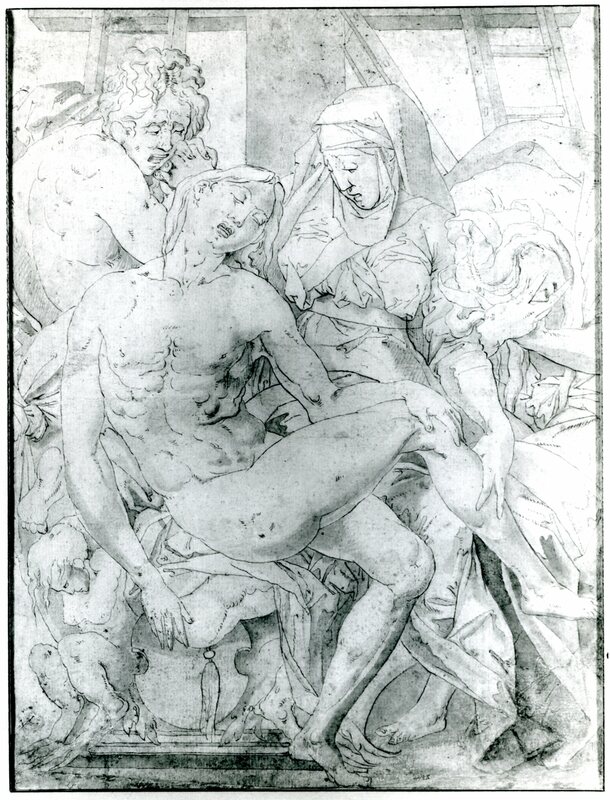 The three drawings show the same kind of draughtsmanship that appears in Rosso’s Throne of Solomon of 1529 (Fig.D.34) and in his Pandora and Her Box of around 1536 (Fig.D.67a), although the studied look of the handling of the Pietà drawings resembles more that of the earlier drawing. There is in all three drawings the same type of clear pen outlines and the same use of rows of small parallel strokes for the description of internal details. In the drawing in France, there is also shading made with parallel strokes of the point of a brush, as found in the two autograph drawings. 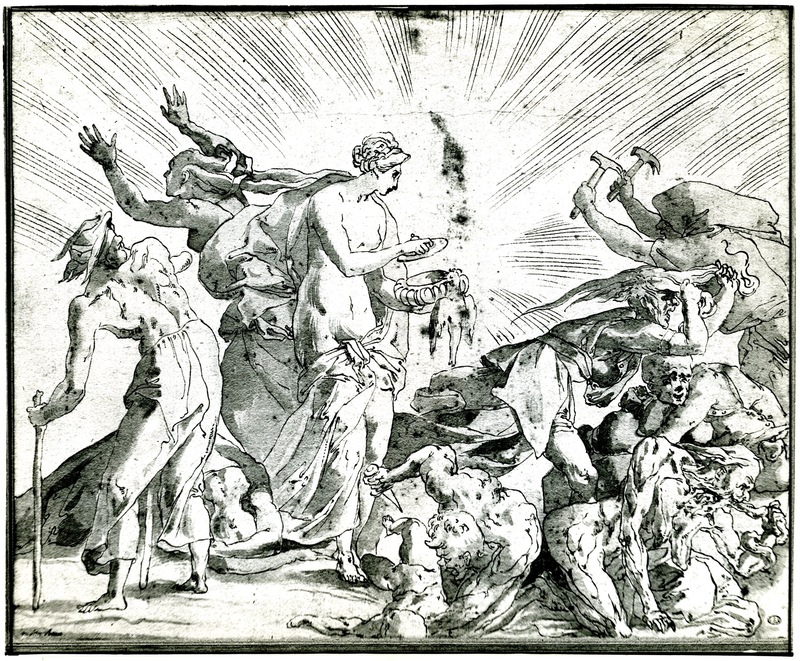 There is good reason to believe, therefore, that the three drawings are good copies, of which the one in France is the best and most accurate, of a lost drawing by Rosso. 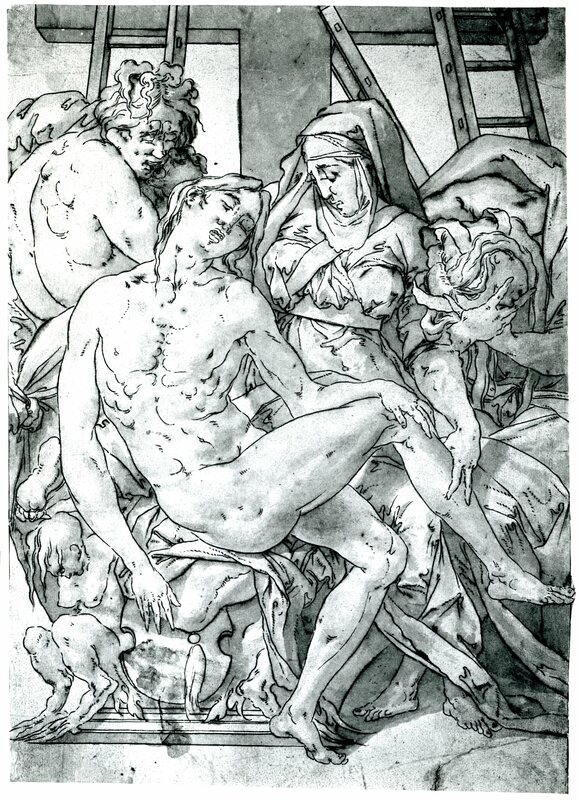 The figure of Christ is, except for the position of the left arm, virtually identical to Adonis in Rosso’s Death of Adonis in the Gallery of Francis I (Fig.P.22, III S a). 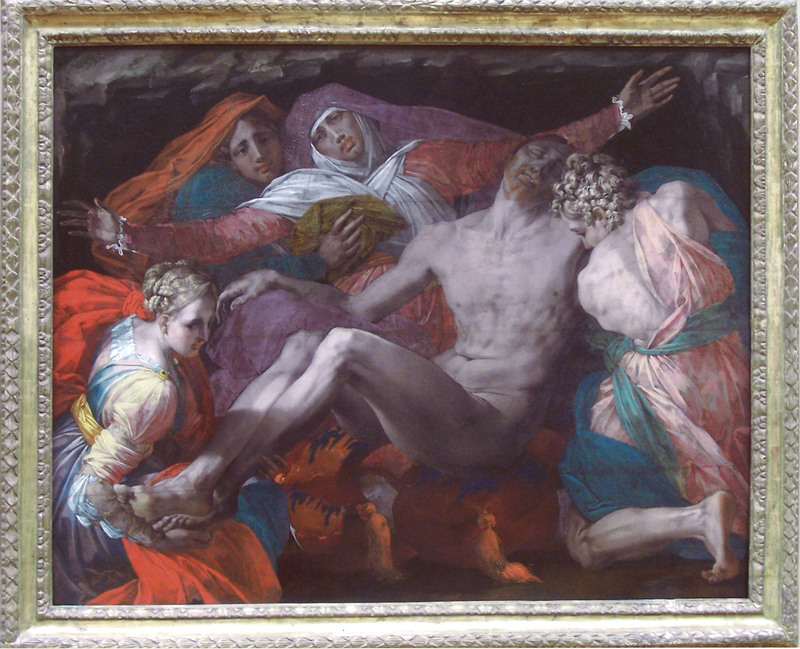 Mary Magdalen’s pose from the waist up is very similar to that of the winged woman in the lower left corner of that fresco. 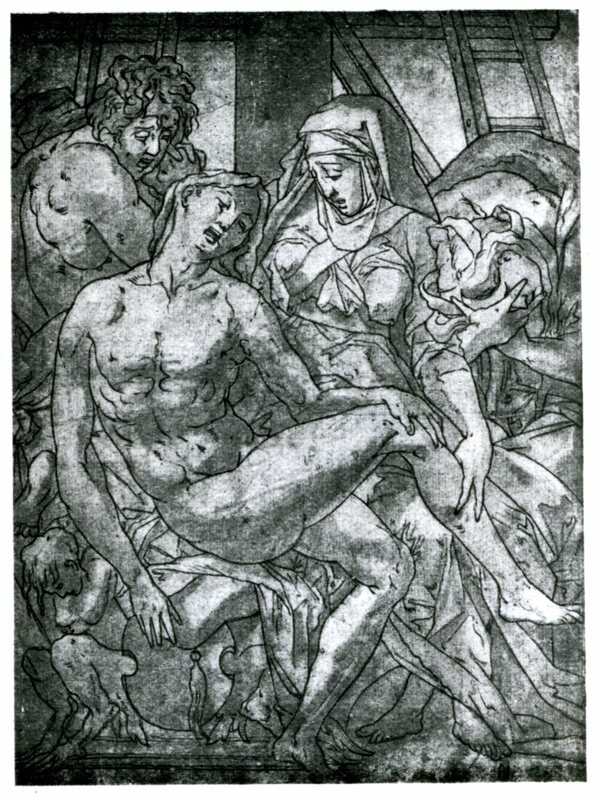 The compact composition of the Pietà is a kind of clarification of that of the Borgo Sansepolcro Pietà of 1527-1528 (Fig.P.19a), in the direction of what appears in the Louvre Pietà of around 1538 (Fig.P.23a). 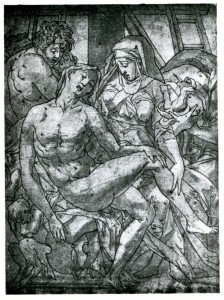 These comparisons not only support Rosso’s authorship of the composition but also point to its creation in France, where it was etched by Fantuzzi (see below). The similarity of this Pietà to the Death of Adonis suggests that both were done about the same time, although it is likely that the frescoed scene, invented for a major project, preceded the drawing, even though Rosso had in mind the subject of the drawing when he conceived the painting. 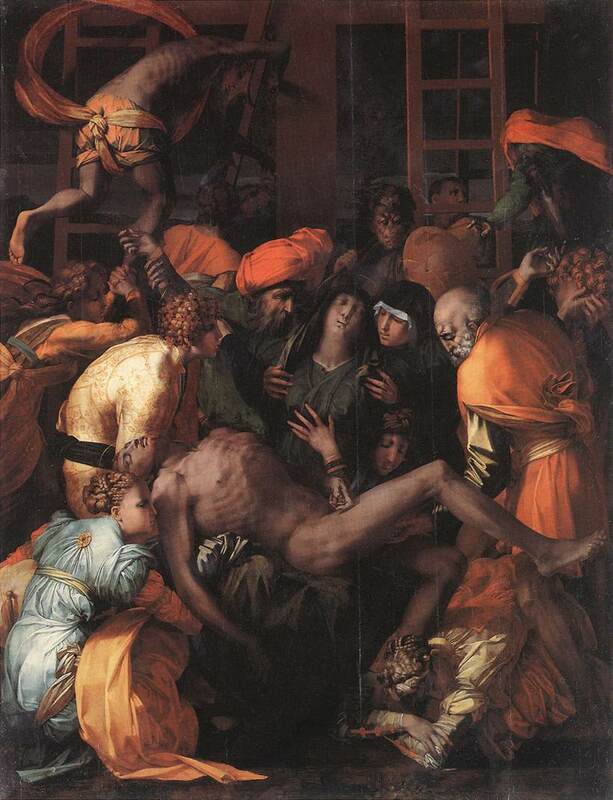 The greater clarity and concentration of the Pietà also suggest this chronological relationship. The drawings do not, however, show a scene with the grand expressiveness of the Louvre Pietà of 1538 or of other works that seem to have been done later. 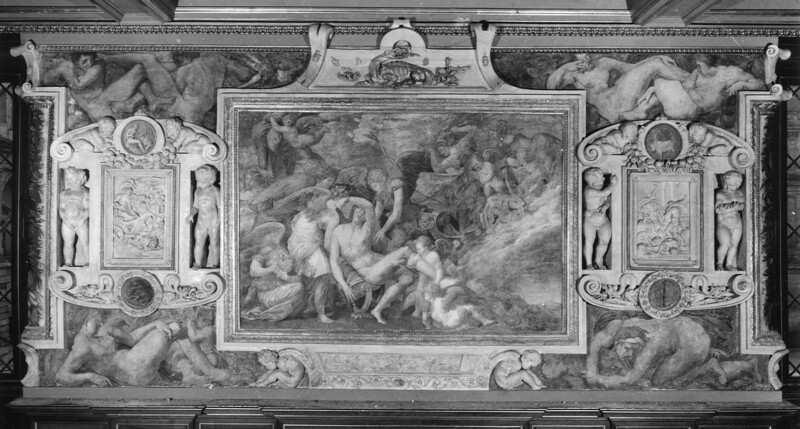 It is likely, then, that the lost drawing was done around 1537, after the fresco of late 1536 and before the painting of around 1538. 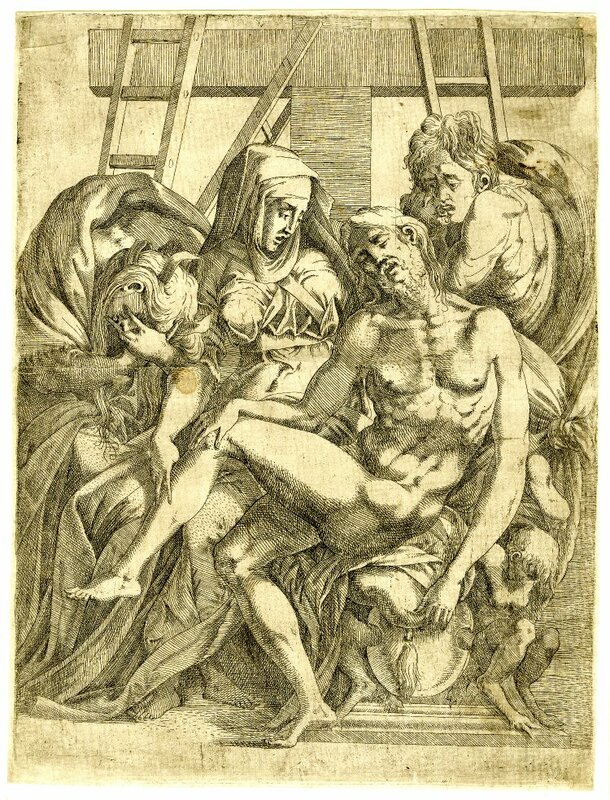 PRINT: Fantuzzi, E.80 (Fig.E.80). Etching in reverse of D.71 and slightly extended on all sides. Christ has a beard, the arm, shoulder, and back of St. John are covered with drapery, the shield beneath Christ is convex in the center, the horizontal crossbeam of the cross is fully visible, and the rungs of the ladders are slightly differently placed. 1 Photograph. Service de Documentation photographique, Réunion des Musées Nationaux, Paris, neg. no. 72 En 4346. I should like to thank Sylvie Béguin for bringing this drawing to my attention, and for sending me information on it and on the source of a photograph of it.